The British Physics World editorial team has chosen the work on Borexino's "Detection of solar fusion" as one of the top ten world breakthroughs of 2014. The award citation says: "To the Borexino collaboration for being the first to detect neutrinos from the main nuclear reaction that powers the Sun." Shielded deep within the bowels of the Gran Sasso mountain, the experiment is designed to detect neutrinos, an elusive form of particle created during nuclear fusion in the core of the sun. Although billions of such particles penetrate every square centimeter of the planet Earth every second, they are extremely difficult to capture. For the first time, Borexino has been able to directly detect neutrinos created during one of the most important nuclear reactions that occur in the sun, the fusion of two hydrogen nuclei. The top 10 breakthroughs were selected using the following criteria: fundamental importance of research; significant advance in knowledge; strong connection between theory and experiment; and general interest to all physicists. "All works represent an important step forward made by a team of creative and talented researchers. 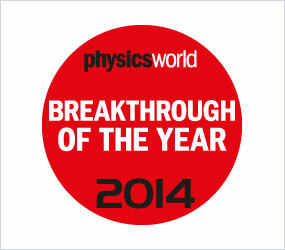 Our congratulations are extended to all of those involved", says Dr Johnston, editor of physicsworld.com.